If you were following the news in the US this weekend, you know that Charlottesville, our little town, became an epicenter for a terrifying rally of white supremacists, Nazis, alt-right instigators, and domestic terrorists from across the country. One woman was killed in an act of terrorism straight out of the ISIS playbook, and 19 more were seriously injured. We live less than a mile from Emancipation Park, shown above, which was the center of the violence and rage. Our church is right across the street from this park. Since Saturday, we’ve been decompressing for hours on end, like many of our neighbors and friends. My stomach fills up with dread when I read those words. I pray that it won’t be true, that days like Saturday don’t become commonplace in our town. And yet it jars us all out of our complacency. We realize we’re not inoculated from hatred; it breathes and grows right under our feet, right next door. Charlottesville has a dark history of racism that it covers in a veneer of prestigious history and genteel Southern charm. In my bubble, on my street in a hippie neighborhood, it is easy to believe that we don’t have a problem with racism. Clearly, we do. If ending white supremacy is the goal, tweeting about it shouldn’t be my primary action. The older I get, the more I am convinced that tweeting about racism and white supremacy doesn’t do much, if any, good. Hearts and minds aren’t changed by social media posts. The internet just serves up our own opinions, whatever they are, and calcifies them. Facebook doesn’t soften our hearts—or change the minds shrouded with hate that need to be changed. If the echo chamber of the internet doesn’t have concrete solutions, where else should we look? Here are a few actions that I’ve been thinking about lately. Support the good work of local nonprofits and humanitarian organizations. We love The Haven, Computers4Kids, New City Arts, the Women’s Initiative, Big Brothers Big Sisters, and the International Rescue Committee, among others. Sara Benincasa also has compiled a list of Charlottesville nonprofits that could use help. Stay in your church or whatever community you belong to. Stay and do the hard work there of talking about white supremacy. Don’t leave because discussions aren’t happening at the pace you want; start the discussions yourself. Don’t wait for someone else to. Talk to people. Talk to your relatives who voted for Trump. Withholding judgment, listen to them. (I find this particularly hard to do, but I’m learning that it’s vitally important if we are ever going to be able to get through to someone.) Ask them questions. Lots and lots of questions. Form relationships with people whose opinions you find repulsive. This, especially, is the primary way to create significant change in our communities. It has to start at the very small, very local, very intimate level. One person at a time. Starting with myself. I hope I can become less horrible, in the wake of all of this, and be more gentle and gracious. It is difficult and seemingly endless work, but I hope and pray Charlottesville is in it for the long haul. Thank you Abby. We all have so much work to do, starting in the church and moving right into the world where we must make God’s love, mercy, and compassion known to all. “Hearts and minds aren’t changed by social media posts”- thank you for addressing the importance of concrete, positive action. Here’s hoping you and yours stay safe. 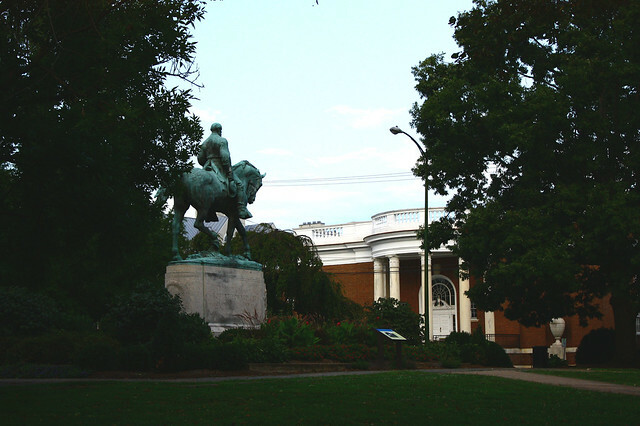 I used to spend a l ot of time in Charlottesville-and wanted to live there-It was charming and the folks so very friendly. I love the culture there. I am praying for Charlottesville. Terrible news coming out of a great city. I didn’t know he went to UVa. Not excited about having him as a fellow alum.